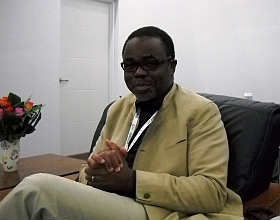 CHANGWON, Oct 21 2011 (IPS) - Luc Gnacadja, in his second three-year term as executive secretary, United Nations Convention to Combat Desertification (UNCCD), is widely seen as delivering on his commitment to manage the world’s drylands. At the UNCCD’s Oct. 10 – 21, 10th conference of the parties (COP-10), he has made substantial progress in bringing this ‘poor sister’ of the three Rio Conventions (Climate Change, Biodiversity and Desertification) closer to its rightful place. Passionate about his mission, this Benin-born architect was minister of environment, housing and urban development in his country from 1999 to 2005 and received the World Bank’s ‘2002 Green Award’. In this interview with IPS correspondent Manipadma Jena, Gnacadja argues in favour of private investment in land management. Q: Drylands are overwhelmingly regarded as marginal lands, whereas they are precious gene pools for desertification, land degradation and drought (DLDD). What is UNCCD’s strategy to change this thinking into a positive one? A: I think we have to get better at using the wisdom, knowledge and the successes of people living in drylands. For climate change to pick up that overarching momentum in the late 90s, scientists did good work in communicating related facts and figures. Some outstanding people, some policy makers understood the serious implications and presented the information in a way that challenged the world. COP 10 is an opportunity to pick up information about food security and act on it before it gets too late to remedy the situation. The economic crises of 2007-08 and again in 2010-11 have shown that if we go on doing business as usual, degrading land at 25 times the historical pace, losing 12 million hectares – areas larger than my country Benin – to drought and desertification, it is ‘mission impossible’ to feed nine billion people by 2050. Q: You just mentioned that scientists are getting better at communicating the science of climate change. How people-friendly are they getting at communicating the science of desertification and land degradation? A: Till as late as 2009, a commonly agreed platform to measure desertification was not available to us. Countries had not agreed on any impact indicators that could measure and monitor stress. At COP 9 in Buenos Aires, Argentina, we got the required input from scientists and the decision to make two (percentage of green cover and percentage above the poverty line) of the 11 DLDD indicators were made mandatory for reporting. These scientific indicators will be made further people-friendly; but you are right, we need to do more because soil is much more complex, diverse and site-specific. Soil is the answer to global warming – it is the second largest carbon sink next to the oceans. When carbon is sequestered in the oceans it acidifies the ecosystem, but when sequestered in the soil, carbon benefits food security and the biodiversity. Why are we not able to appreciate this? Q: What could be the reason for the world not appreciating and acting on this? A: We only see what our spectacles allow us to see. When one does not see what one needs to see, we need to change our spectacles and it is our responsibility to provide the appropriate one – one for the general public and yet another for policy makers. Q: The involvement of the private or business sector evolved substantially during COP 10. Incentives for the business community are expected; how will the checks and controls be exercised? A: We need the private sector in sustainable land management (SLM). Governments world over spend some one percent on this, the rest comes from the private sector that includes small farmers to large corporates. The governments must create a conducive atmosphere to harness private investment in SLM and guide the investment in the correct direction. At COP 10, for the first time a 90-company strong business forum has taken the initiative to be part of the UNCCD call to create a land degradation neutral world and voluntarily declare their commitment to work to this end. This dialogue between the private sector and the governments will exercise the checks and balances. We need to maintain and sustain this dialogue. The private sector needs to understand that any investment it makes has to be win-win – beneficial for the local population- even what is being called ‘land-grab’; beneficial to the resource base and ecosystem and of course profitable to themselves as well. And, this is possible. Q: How and how much do you see the Changwon Initiative helping to combat DLDD? A: The Changwon Initiative is a political initiative of the Korean government which will be chairing the COP bureau for the next two years till COP 11. It will help the UNCCD mission because it is focused on the three pillars that we need to accelerate the action to combat desertification. The first pillar that the Changwon Initiative will be helping with would be strengthening the scientific input in policy making and strategy formulation by building up a global knowledge data base on DLDD. The second pillar is to build a stakeholder inclusive process and define each stakeholder’s scope of action. The missing stakeholder – the private sector – has been brought in by the Changwon Initiative. Q: Civil Society Organisations (CSOs) are an important partner too and the Global Alliance of CSOs here is complaining that the Changwon Initiative does not even mention CSOs? A: Yes, but proposals for the inclusion of CSOs in the Changwon Initiative have been welcomed by the Korean government. Sometimes the CSOs are so prompt to criticise; they also need to be accountable. They need to be proactive and not just vocal. They realise that they are influential but influence calls for action, not just keeping the mike and being vocal. I hope the government of Korea will take CSOs on board because they too will be part of the checks and balance on the private sector. Coming back to the third pillar that the Changwon Initiative will reinforce – it is rewarding those who are keeping the drylands productive. To this end they have, at COP 10, given away the first ‘Land for Life Award’. This helps replication of good practices. I am hopeful that the Parties will take similar initiatives. Turkey and Qatar already have and the latter has formed the Global Dryland Alliance. Q: What decisions have the Parties taken during COP 10 to more expeditiously mainstream gender into the DLDD programmes? A: None, yet. But I am hopeful they will before the conference ends Friday. Parties have agreed that women and children through their mothers are the worst affected by DLDD; that they are the invaluable custodians of traditional farming knowledge. Parties must ensure that women have access to land and the support that makes farmland productive and to capacity building. The parties too must ensure women-inclusive policies are in place through parliamentary action. Q: How can the UNCCD intervene to ensure this? A: Countries are very zealous about their sovereignty. What UNCCD can do is provide a draft policy framework which, if approved by the country’s parliament, opens the pathway for us to facilitate its implementation. Any government that knows about statistics cannot ignore the capable and resilient half of the population and still hope to develop… it is like cutting off one of the two legs. Q: It is not as if governments do not know the importance of women to a country’s growth. What seems to be the roadblock for action? A: There are some beliefs that are deeply ingrained. But we can do it! We must better inform and highlight success stories in lot more contexts, including programmes that have successfully implemented gender inclusion. Sharing widely is the key, so that those who do not know can learn. Q: How do finances, funding and aid work for Parties under the Desertification Convention? A: In 1996 when the Convention was formulated, it was agreed that affected countries would design their action programme, mainstream it – in other words put their money where their mouth is. Only after the affected country has established SLM as a national priority through appropriate parliamentary action and budgetary allocation would developed countries commit technical transfer and financial support. Both ends have failed in their commitments. Poverty and food security are inextricably linked. If countries prioritise poverty eradication but do not integrate SLM into their programmes they are failing themselves. Countries have trade as their priority; they have 26 percent growth but find that both poverty and food insecurity have increased. Q: Are you happy with the progress of the COP 10 over the last 11 days? Has it met your personal expectations? A: COP 10 has set milestones with many ‘firsts’ and a landmark with 6,450 registered participants from over the world. The level of participation in the high-level segment (ministers included here), the substantive quality of interactions, the importance accorded to science, the launch of the ‘Land for Life’ award, and the establishment of the business forum: all give a sense of satisfaction. But, I will wait to see the outcome of the budgets for the convention, to see that Parties honour their commitment in budgetary terms. I also wish to see the streamlining of efficiency and coherence in the set-up of the Convention solved here once and for all.